Dr Jean Uayan comprehensively weaves the story of six Protestant Chinese churches in the Philippines into the local history of their individual settings in this important study. Uncovering new insight and historical information from extensive primary and secondary sources, Uayan presents a rich and previously unacknowledged heritage and support from four American mission organisations during the US occupation from 1898-1946. The seeds sown amongst Chinese communities across the Philippines resulted in indigenous churches that took differing journeys to full independence and now are also bearing fruit in missionary activity in South Fujian, China. This book is an important contribution towards a global church history acknowledging the work of the Holy Spirit establishing and building up the church of Jesus Christ among the nations. 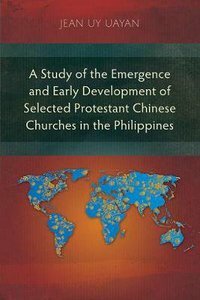 About "A Study of the Emergence and Early Development of Selected Protestant Chinese Churches in the Philippines"